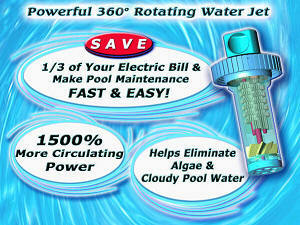 A growing popularity in pool water sanitizing. Copper Stains and Discoloration: Causes, Sources and Solutions. Avoiding Staining and Discoloration, every time new water is added!!! Test your source water for iron, copper and manganese, to determine, if dissolved metals present a potential problem. It is better to avoid a problem, than to try and treat it, after the water has been added to the pool. The products below can remove sediments, metals such as iron, copper and manganese and contaminates such as sulfur. 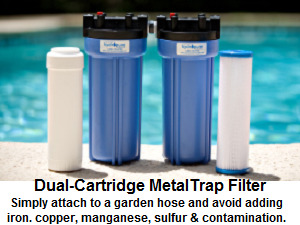 The MetalTrap Filter, available in 3 sizes, attaches to the garden hose and removes dissolved iron, copper and manganese. 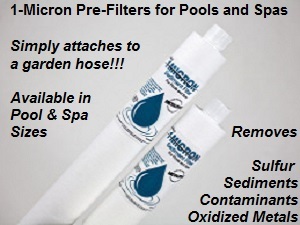 The MetalTrap 1-Micron Filter removes ultra-fine contaminants, including sulfur. The MetalTrap Dual-Cartridge Filter, available in 3 sizes, attaches to a garden hose and removes dissolved heavy metals and sediments. One cartridge is washable and reusable and the other is replaceable. Removing Stains and Discoloring Metals, from the pool water!!! Look for the presence of blue, green, purple, gray, brown-black stains, as these can indicate copper. The added presence of iron or manganese can add different discoloration possibilities. Even if there is no obvious staining, the presence of heavy metals will cause water discoloration and possible staining, after chlorine or bromine are added or the pH is raised. Depending upon the severity of the problem, the products below can help you eliminate or avoid problems. The Stain Reversal Kit contains everything needed to remove the metal stains, eliminate the heavy metals and help prevent a recurrence, of the problem. The Stain Remover removes iron copper and manganese stains. 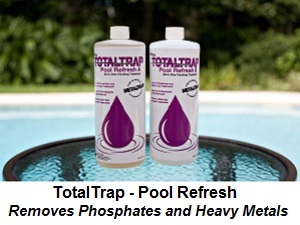 Pool Refresh-Total Trap helps eliminate heavy metals and phosphates, by filtering or vacuuming them out of the pool water. Test the water chemistry and adjust the pH, total alkalinity, calcium hardness and cyanuric acid, as might be necessary. A ColorQ, All-Digital Tester can perform all of the common pool water tests and eliminates the color-matching and guesswork. Some tester models, such as the #2067 ColorQ PRO 9-Plus, perform all of the common pool water tests, plus copper and iron. Reliable water testing will help get the pool swimming-ready. Better Circulation helps make everything work more effectively. The Circulator is a return jet replacement fitting, that improves filtration, eliminates dead zones that promote algae growth, improves sanitizer distribution and improves chemical dispersion. 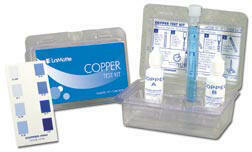 A simple Copper Test Kit can help you monitor the copper level and determine the course of treatment. How to treat and avoid copper problems in swimming pools? Frequently, Copper can be found in swimming pool water. Most commonly, it is introduced into the water in the form of a chelated (stabilized) copper algaecide or winterizer. Copper, in this form, usually does not cause a pool problem, if used properly and as directed. Copper is rarely found is municipal water supplies. Naturally occurring copper, is occasionally found, in well water. It is copper from this source or from corrosion of copper heater cores or piping that is capable of causing blue-green or even dark colored staining or discoloration. Copper problems can be controlled with proper chemical treatment and techniques. A water analysis is required to determine the concentration of copper present and help assure that it does not reach the level, where staining and discoloration can occur. An alternative method of dealing with known heavy metal problems is to use the METALTRAP Filter, which can physically remove the metals, as the pool water is being added. 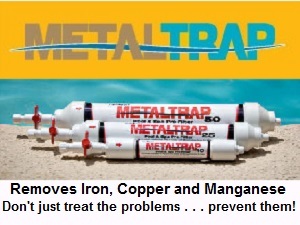 Copper and other heavy metal problems can treated with Pool Refresh, used in conjunction with other METALTRAP products. Recirculating the pool water, through a METALTRAP Filter and a small submersible, can lower the copper ion levels, to that manufacturers by the ionizer manufacturer. This approach help preserve ionizer performance and reduces the likelihood of staining and discoloration. Several models of ColorQ All-Digital Water Testers will allow you to monitor the pool water quality and do a test for copper, without any need to color-match or guess. If problems arise, refer to the Pool Problems Page, as a source of problem-solving information, broken down into various categories. Scroll down the page and click on the linked keywords, catch phrases or images, in the archived answers below, to access additional information, on that topic or product. Brown, Black or Purple Brown, Black or Purple colors are usually an indication of manganese being present. This most often occurs, when well water is being used. A test of the source water should confirm the presence of manganese. While the use of a MetalTrap Stain Reversal Kit will help solve the problem, a MetalTrap Dual-Cartridge Filter should be attached to the garden hose, in order to avoid future recurrences. The presence of copper and high levels of cyanuric can lead to purple discoloration, due to the formation of copper cyanurate. Lowering the CYA level and treating for copper should help resolve the problem. ► Purple Discoloration Due To Copper Cyanurate? I have been using trichlor tablets, in a feeder, and supplementing it with a copper algaecide. The spring, upon opening, my water developed a purple caste and there may be some staining, as well. I have read up, that manganese can be associated with purple discoloration. I don't use well water and had the water tested, for manganese, and it is negative. Is there another possibility? Thanks for your help. Best regards. The presence of high levels of cyanuric acid and copper can form copper cyanurate, which can explain the purple color. When you use stabilized chlorine, the cyanuric acid is always on the rise. In fact, higher levels, over 150 PPM, can lower the effectiveness, of chorine, and are best treated by partial water replacement. Instead of using trichlor tablets, you might consider using a salt chlorine generator, which will eliminate the build-up of cyanuric acid and provide better water quality and more control over the chlorine level. If you want to stick, with trichlor tablets, you might consider adding a Solar-Powered UV Sanitizer, as both will decrease chlorine usage and slow the rise of cyanuric acid. If you feel that an algaecide is beneficial, I would suggest a 60% polymer algaecide, which contains no copper and has the added benefit of not foaming, as do some other common algaecides. So far as the purple discoloration and/or staining, I would treat the pool with a MetalTrap Stain Reversal Kit. It should eliminate the "purple" and remove the copper, as well as any iron and phosphates. I hope that this information will be helpful. ► Too Much Copper, Due To Ionization? I have an ionization-oxidation unit and I evidently have operated the ionization too high, resulting in too much copper. I know if I add standard metal treatments, it will inactivate the copper. Is there a way to remove only the excess copper and lower the level to 0.3 PPM. I have shut the ionization function off, but it might take a long time to drop, from 0.9 to under 0.3 PPM. Thank you for taking the time to answer the question. You're right amount the metal treatment. Unless you add precisely the right amount, you risk deactivating all of the copper. There is a solution. Attach a MetalTrap Filter cartridge to a garden hose and a small submersible pump. The pump goes into the deep end and end, with the MetalTrap filter is placed so that the returning water enters the skimmer. Test the copper level and retest every 8-12 hours. As water passes through the MetalTrap filter, the copper will be removed. When it drops to 0.3 PPM of copper, you can stop the recirculation and remove the pump, from the pool. This way all the remaining copper is still in the active, ionic form. I hope that this will be helpful. ► Copper Heater Corrosion Problems Caused By Low pH? Thank you for your Q&A forum! What a great site! Okay, after reading your forum, I have read pages, lol, I can't find anything on if I need to replace a heater once it has been exposed to, to low pH and chlorine. I just bought it less then a year ago for $1,000. My pool is above ground splash around. 12x 22. I had green hair followed by weird green staining on floor and walls of pool and then a crusty green waterline. Pool store said copper above 1 ppm, So after spending $$$$$ I drained 1/3 of water, put in a metal treatments. Did this twice. It dropped down to under 0.5. Then it's back up to 1 ppm. Okay, so today we now know it is our heater we bought at end of summer last year. Finally my question, Is the heater trashed? If I make sure my ph is stable from here on out, is it safe to use and not get copper leaching in the water again. Did I ruin the heater? Help please. Most likely, you did not destroy the heater, but damage has occurred. Low pH, with chlorine or bromine present, will result in copper corrosion. It amounts to a few ounces of copper dissolved, in your case. As long as the heater works and there are no leaks, the heater is still wo rkable. My guess is that you are using trichlor tablets, which are acidic. If that is the case, you should NEVER add them to the skimmer and, if used in a feeder, must be plumbed last in line and separated from the heater, by a check valve. You need to make sure the pH never drops under 7.0. Having a total alkalinity of at least 100-120 PPM will help assure that the pH does not drop quickly. You need to pay more attention, to the chemistry, on a daily basis and a ColorQ all-digital tester would be ideal. 1 PPM of copper is too high. You want it under 0.3 PPM. You can do that with a MetalTrap Filter, some garden hose and a small submersible pump. Just recirculate the pool water, through the MetalTrap Filter and back into the pool. It will remove copper, as water passes through. You should lower the level to 0.1-0.2 PPM, to be on the safe side. A salt chlorine generator is an easier, better and more controllable way to use chlorine. It avoids chemical buildups caused by rational chlorine products, such as high cyanuric acid levels. We offer two, no installation models and one of them is solar-powered. Salt chlorine generators tend to make the pH rise, so low pH will be a thing of the past, unless you get heavy handed with acid additions. Just remember, you can always add more - you can't take out. I hope that this information will be helpful. Should you be testing your water, for Copper and Iron??? ► Copper Pool Water Testing? I HAVE A QUESTION ON COPPER. WHAT DOES COPPER DO TO YOUR WATER AND EQUIPMENT AND WHY DO YOU NEED TO CHECK. NOT EVERYONE CHECKS FOR COPPER BUT I DID BECAUSE I HAVE THE WATERLINK EXPRESS. MY COPPER IN MY POOL WAS AT .3 AND THEN I USED A COPPER BASED ALGAECIDE AND MY COPPER WENT TO 0.7. I HAVE TREATED IT 3 TIMES WITH NO LUCK WITH A METAL TREATMENT. COPPER WENT DOWN AFTER TREATING IT THE SECOND TIME TO 0.5 AND THEN SHOT UP AGAIN. I CLEANED MY FILTER AFTER THE SECOND DOSE. I DOSED THE THIRD TIME THIS MORNING AND GOING TO CLEAN MY FILTER TONIGHT. I HAVE A SAND FILTER. IS IT IMPERATIVE TO GET THE COPPER DOWN TO 0.0? THANK YOU AND LOOKING FORWARD TO HEARING FROM YOU. Good question. Pool owners that use ionizers, Solar-Powered Dual-Ion Purifiers/Mineralizers or copper algaecides are spending money to put copper into the pool water. The problem with copper is its form. Ionizers and mineral sanitizers add copper ions at very low levels: a few tenths of a PPM at most. Copper algaecides add copper in a chelated or stabilized form: usually at concentrations well below 1 PPM. Where copper does cause a problem is when it is present from copper sulfate or corrosion at more than trace amounts. Now that I made the case for copper being in the pool, here's the problem. Most of the metal treatments claim to remove copper, iron, etc. This is a misleading statement, inasmuch as they do not actually remove copper or iron. Where did it go? In reality, these products help control copper and iron, by keeping it in solution in a stable, chelated form. In many instances, the test equipment may still pick up the copper. Adding more metal treatment will not remove the copper and may have no impact on the test reading. However, the copper is chelated and should not cause staining or discoloration. In pools that are using mineral sanitizers or ionizers, the addition of metal treatments is only done as a last resort, because it may inactivate the copper ions. MANY METAL TREATMENT USE ORGANIC PHOSPHONIC ACID, WHICH CAN DEGRADE TO LEAVE YOU WITH PHOSPHATE PROBLEMS AND ARE NOT VERY EFFECTIVE AT A pH OVER 7.8. Pool Refresh is a two-part product, that helps you remove copper, iron and phosphates, by vacuuming ot filtering them out of the pool. I hope that I have explained the problem. ► Copper Ionizer - Too Much Of A Good Thing? I have been using an ionizer and have allowed the copper level to get too high above the recommended level. I have kept the pH close to 7.2 and have not had any staining. How can I lower the copper, to a safer level. I believe that under 0.3 PPM, is preferred. Any help would be appreciated. Thank you. There are two solutions. One good and one not so good. You can add a chelating agent, such as Liquid MetalTrap. This would chelate or complex the copper and reduce its potential to cause staining. However, this interferes with the action of copper, as an algaecide, and makes it difficult to determine how much active copper ions you actually have. A better way is use a MetalTrap Filter and a small submersible pump, with garden hose connections. Simply connect the garden hose to the pump and place in the deep end of the pool. Attach the other end, of the garden hose, to a MetalTrap filter. Set the MetalTrap Filter on the edge of the pool, allowing the pumped water to flow back into the pool. As water passes through the MetalTrap Filter, copper will be removed. Test the copper level before you start and shut off the ionizer. Keep this process going and monitor the copper level, on a daily basis. When the copper level drop to under 0.3 PPM, you can stop. If you resume use of the ionizer, makes sure that you set it at a lower output level and keep monitoring the level, at least once or twice a week. This second method doesn't defeat or hamper the performance of the ionizer, but will help restore an optimum copper level. I hope that this information will allow you to avoiding the down side of too much copper. ► Copper Stains And A Difference Of Opinion? Upon returning to Florida this winter season, I noticed my pool had dark stains on the side walls and bottom. The spa had even worse staining. My pool service guy, who comes once a week to service the pool, advised me that the stains were caused when my pool heater core corroded, spilling water out of the core on the lawn and needed to be replaced. He said this caused copper to leach into the pool. The pool heater was 12 years old. He recommended that the pool be drained and acid washed for $500. Another pool guy said it was caused by improper acid levels in the pool that caused the pool heater core to leach out the copper. Who is right? The laws of chemistry are right. No matter how old the heater is, copper will only be subject to corrosion, if chlorine is present and the pH is under 7.0. The lower the pH, the worse the corrosion. If chlorine is not present, no corrosion will occur, even if the pH is down to zero. High chlorine and pH will not corrode copper, either. Copper will only dissolve in acidic water, if an oxidizing agent (such as chlorine or bromine) is present. The other "pool guy" is right and it is indisputable! For help on dealing with copper stains, a MetalTrap Stain Reversal Kit should do the job and it is a lot less expensive than an acid washing and water replacement. I hope that I have settled the dispute, but you'll have to solve the problem. ► Misguided Approach Towards Sanitizing? I have been using copper sulfate pentahydrate in my pool at home for 11 months now. I test everyday and maintain a copper concentration of 1ppm. I do not use Chlorine. I do use a pH balance and flocculant. Just recently I have had extensive blue staining around the pool and the stainless steel ladder has become "copper plated". I have read that this is due to galvanic deposition. I have also noticed a strange smell to the water and have a sticky feeling on my skin after swimming. The pool has been more cloudy than usual as well. Any ideas on the reasons? Thanks. The smell and sticky feeling are due to inadequate sanitation. Your approach to pool sanitizing was doomed to failure. Copper is not a complete sanitizer. It is primarily an algaecide and is not recognized as being able to control bacterial growth. In addition, you failed to use an oxidizer to destroy organic byproducts and wastes. Copper sulfate is not recommended, for use in swimming pools, because it can lead to staining and discoloration. The maximum recommended level for copper, when added by ionization, mineral sanitizers or copper algaecides is 0.3 PPM and only if the pH is kept close to 7.2. You tried to avoid chlorine and that is not as easy as it seems. Trying to minimize chlorine use was more attainable. Unlike copper, chlorine is an oxidizer and a complete sanitizer. You are between a rock and a hard place. If you try and remove the stains, as detailed below, it has to be done without chlorine or other oxidizers present. Once the level is lowered or treated appropriately, you will have to add lots of chlorine and establish a stable level of 1-3 PPM. That should address the odor and slime issues. Because the slime may be covering stains, you may have to repeat this procedure. This is not going to be easy or inexpensive. There is no silver bullet. Once you solve the problem, I would give thought to adding a salt chlorine generator. It is the better way to add chlorine. Too much copper can result in staining, especially, if the pH is high. Adding an organic phosphonic acid product can help. However, these products can break down over time and allow a return of the copper problem, as well as a phosphate problems. Just adding the product rarely removes all the stains. To deal with heavy metals, such as iron, copper and manganese, a MetalTrap Stain Reversal Kit, available in our website store, contains the complete regimen of products to remove the stains, eliminate the metals from the water and help assure that a recurrence does not happen. So far as I know, no pool chemical manufacturer markets 100% copper sulfate, as a pool algaecide, because of the inevitability of staining, green hair and fingernails. I hope that this information will be helpful. How to deal with Copper stains and contamination. First, I want to let you know how pleased I am with my ColorQ PRO-11 Test Kit. I have had it for about three years now and the ColorQ Pro-11 has provided reliable, easy testing of my pool and spa water. The question I have is a whether or not copper in the water "eats" the plaster of a pool. During the recent installation of a replacement safety cover, the installer pointed out that I had some bluish flecks appearing in the white plaster of my gunite pool. He said that it was a result of a buildup of copper sulfate that was in the Granular Pool Sanitizer, that I use, and that I should get the pool acid washed to remove the stains before it eats my plaster. Since I just had the pool re-plastered two years ago I really don't want to go through an acid wash this soon unless I really do have a problem. My research hasn't turned up anything indicating a problem with this specific chlorine product and plaster nor, for that matter, copper and plaster. As further background, I removed virtually all copper plumbing from my filtration system three year ago and my current copper reading with the ColorQ PRO-11 is 0.4. What are your thoughts on this? It would take a considerable amount of copper sulfate to get a copper reading of 0.4 PPM. Most chlorine products with copper sulfate, contain low levels. Try placing some 500-mg vitamin C tablets on a stain and allow to dissolve. If this works, I suggest that you use a MetalTrap Stain Reversal Kit. It contains everything you need to remove any copper stains, eliminate the copper, from the pool water and help prevent a recurrence. Copper does not eat plaster! It is acidic, corrosive water conditions, that etches plaster and, if chlorine or bromine are present, will corrode copper plumbing or heat exchangers. You can better preserve the plaster finish, by keeping the pH at 7.2-7.6, the TA at 80-120 PPM and the calcium hardness at about 200-250 PPM. I suggest not using a product that contains copper sulfate, as 0.4 PPM is already higher, than you want it, even if you were using an ionizer. I hope that this information will set the record straight. ► Copper Panels Causing Concern? My daughter has been getting green hair ever since we installed our pool 9 years ago. I researched and found solar panels manufactured in the LA area. They always stayed straight and did not reduce pump pressure by using ½ copper lines encased with aluminum fins that absorb heat into the water in the copper lines. I thought it was great and have been very happy with it until my daughter continued to get green hair. It appears that the copper is getting to great levels because it always just recirculates the same water thru the solar panels. A solar installer says that I have to change the panels and drain the water. That the panels are for domestic water heating systems and can not be used for a pool. My questions are: 1. Will putting a mineral reducer in the water solve my daughter green hair problem? 2. Will continuing to have the water go thru these copper pipes in the solar panels become a problem? 3. Should I change out the panels? Thanks. If you allowed the pH to fall into the acid ranges and were using chlorine, the copper will dissolve. There are pools with copper heat exchangers and copper pipes and they don't necessarily have problems. Keep the pH up and there should b e no problem. These panels are not widely used, probably because of the cost. Plastic is less expensive and not prone to corrosion. If you opt to replace the panels, some models would be an ideal DIY solution. Have the water tested for copper. It will be present. 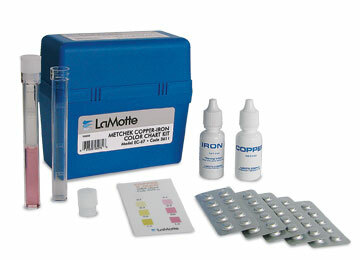 Add a dose of a quality metal treatment, such as Liquid METALTRAP, for each 1.0 PPM of copper. Add another one monthly. If the copper is more than 2 PPM, you might consider replacing some water, to get it under 0.3 PPM. Another option would be to use a METALTRAP Filter and a small submersible pump, to recirculate the pool water, until the copper level drops. The treatment could prevent further greening of the hair. Any chlorinator should be last in line and separated by a check valve. Have your daughter use an acidic hair condition. Apply generously, and leave on for 15 minutes. Repeat, as necessary. Stains are probably due to copper and are rarely removed by simply adding a metal treatment. You might have to use a product such a METALTRAP Stain Remover. I hope that this information is helpful. ► A "Safe" Copper Level? We have the instructions for the LaMotte code 3619 copper testing kit but it doesn't say the colour which is a safe level can you help please. If you are referring to what level of copper is "safe", that can depend upon the source of the copper. If the source is natural or corrosion of copper components, the content is best at nil. Any measurable quantity should be treated. If the source is a copper algaecide, 1 PPM is generally the suggested upper limit. If the source is the presence of a Solar-Powered Purifier/Mineralizer or an ionizer, it should be based on the manufacturer's own recommendation. Usually this is on the order of a few tenths of a PPM or 0.3 PPM maximum. 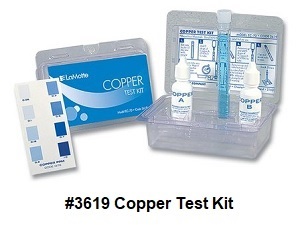 The copper level can be monitored using a simple copper test kit or one of several all-digital ColorQ Labs, that can perform a complete water analysis. I hope that this information proves to be helpful. I hope that this information proves to be helpful. ► Is This A "Toxic" Copper Level? I was wondering how safe it is to swim in a pool that is sanitized by ionization, in particular, if the copper level is higher than the recommended amount. I just got an ionizer installed in my pool and, not being familiar with the system at all, I was not monitoring the copper level. I had someone else do it for us. It turns out that my copper level was at .7 to 1.0 ppm as opposed to the recommended amount of .2 to .3 ppm. At the time, I was also having a lot of sediments at the bottom of the pool. I would ask the people, who would monitor the pool what that was, they did not know. Well now, I know that the sediments may have been excess copper, because when I would vacuum it up it would have a blue/green color. Please let me know how toxic, the pool may have been with such a high level of copper. Thank you. It is not a matter of toxicity - it is a matter of trying to avoid staining. Algaecides typically can add 1 PPM of copper. The lower setting help prevent copper staining and discoloration, while still providing enough copper. Try keeping the pH closer to 7.2, until the level has dropped. Adding a onetime dose of a metal treatment, such as phosphate-free Liquid METALTRAP, might help minimize staining and precipitation. I hope that this information proves helpful. ► Copper Stained Tile Grout? I recently bought a house that had a pool. The heater coils were pretty bad and the heater has been replaced. Unfortunately, the copper from the heater - staining the grout . What steps can I take to remove the copper stains so the tile grout is at least more vibrant than it is now? Would scrubbing the tiles with a mix of water and muriatic acid be a solution? Perhaps scrubbing the tiles with a stain remover is the answer? I have added stain remover to the pool and let it circulate, but this has not provided any noticeable difference. Thank you for any guidance. Regards. Adding a stain remover to the pool water is unlikely to produce any noticeable improvement. Try this. In a plastic bucket, first add 2 quarts of tap water, 1 quart of a quality mineral treatment, such as phosphate-free, Liquid MetalTrap, and lastly 1 quart of muriatic acid. Drop the water level below the tiles and use this solution with one of those sponge-backed scrubbing pads. Make use that you use eye protection and rubber gloves. The purpose of the mineral treatment is to prevent any copper removed from the tile from causing a recurring problem. This mixture should dissolve the top surface layer. Another method would be to use a strong solution of METALTRAP Stain Remover. Unlike oxalic acid products, it is not toxic. Good luck and I hope that things brighten up for you. ► Copper Problem Or Green Algae? Alan, I found your website and was hoping that you could help us. We had a green tint in our pool water. After testing it, the pool store employee felt that copper was the problem. The chlorine level was at zero. Mistake on our part. The pH was too high. She directed us to buy sequestering agent. We did and added it. A day later we also added chemicals to reduce the pH (as directed by the pool store). We went to another pool store (our favorite one) to get the water retested and see what else we could do. They found that the copper levels went up even more after the sequestering agent was added (going from 0.4 to 0.5). They explained that when you use a sequestering agent, you also need to use a clarifying agent. Each time I've added the Clarifying agent, the pressure in the filter goes WAY UP. Normal pressure was around 14, but the Clarifying agent sends it up immediately to over 25! I end up backwashing, which removes the clarifier from the pool. And we start all over again with more clarifier. I've used it multiple times, but the water color isn't changing. Now what? Do I keep trying it but use a smaller dose since it seems to blow out the pressure? The pH is now fine, along with alkalinity. The chlorine level is back to where it needs to be. Now, how do I get that copper out of the water that seems much worse, since using the sequestering agent? Thanks in advance for your thoughts! We need to set the record straight. There is no difference between a reading of 0.4 and 0.5. Both should be considered the same value, as it is within the testing limits of the equipment being used. None of the products will take the copper "out" of the water. "Chelated" copper will remain in the water, in a stable, soluble form that will help eliminate staining and discoloration. The product you used is not a chelating agent, it is a clarifier. It sounds like you could have a DE filter and if that is the case, stop using the product. It is coagulating the filter media and causing the pressure rise. If you don't have a DE filter, the green color and the pressure rising are due to the presence of algae. You may have copper in the water, but it is algae that is turning the water green. Do you have a heater? Did you ever add copper algaecide. If the answer is no, where did the copper come from? If the problem is algae, as I suspect, you need to start boosting the Free Chlorine level to a stable 1-3 PPM. Get the pH to 7.2-7.6. The best way to deal with copper is with a chelating agent, such as phosphate-free, Liquid METALTRAP, and not a sequestering agent. Add a dose as soon as possible. POOL REFRESH is a product that might present a better and easier solution. It will convert heavy metals to a form that can allow them to be filtered out. It is entirely possible that the achieving of a stable free chlorine level and the lowering of the pH will eliminate all of the problems. Minerals are more soluble at lower pH readings and the high pH could not have been a positive factor. 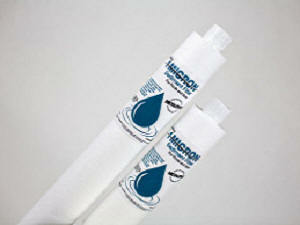 Instead of using liquid clarifier, that interfere with filtration, you can use a 21st Century Clarifier: The Nano-Stick. This product is simply hung from a rail or ladder and lasts up to 6 months. I hope that this information proves helpful. ► Where Has All The Blonde Hair Gone? My two daughters have blonde hair (the natural type) and have developed a greenish tint in their hair. We have had the pool for three years and this is the first time this has happened. What can I do to stop the problem and is there anything that can help their hair? Please help. Thank you. Two possibilities. The chlorine is affecting the hair and/or some of the hair products, that might have been used. The other, more likely possibility is copper. You can have the pool water tested, by a local pool professional to confirm the presence. The question of what is the sourc e of the copper remains. Chelated copper algaecides are usually not the problem, especially if used as directed. If you have a heater and use chlorine or bromine, the presence of low pH conditions over prolonged periods can result in some copper corrosion in the heater. This will add copper to the water in a problematic form. In either case, here is what I suggest. Add a double dose, for each 1 PPM of copper, of a quality metal treatment, such as phosphate-free Liquid METALTRAP. This will chelate (stabilize) the copper and avoid further problems. So far as the hair is concerned, try this: shampoo in the usual manner and apply a generous amount of an acidic Leading Brand Hair Conditioner and leave on for 15 minutes. These products have a very low pH and should help "pull out" the discoloration. Repeat daily, as necessary. Kids can spend a lot of time in the pool and that can make them more susceptible, to this problem, than adults. I hope that I have been helpful. To better assure proper overall pool water chemistry, visit a pool store that has a very reliable, professional lab such as a WaterLink SpinTouch Lab, rather than a less accurate test kit or strip reader. Enjoy the summer. ► Copper Tubing For Algae Control? I heard if you coil a piece of copper tubing and put it in your skimmer basket it will reduce algae growth. I put a piece in and it seems to be better, but not exactly as good as it could be. If I use a bigger piece will that work? You may have heard it, but that doesn't make it right. Copper will not dissolve in pool water, unless there is chlorine or bromine present and the pH is low. However, that will risk corrosion to other metal parts, as well as the creating harsh swimming conditions. There are products and devices that add copper, by various methods. Copper tubing is not one of them! If you want effective algae control, start by keeping the free chlorine level at 1-3 PPM. If you want to add some copper, you can use a Solar-Powered Dual-Ion Purifier/Mineralizer, ionizer or a copper algaecide. I hope that this information will prove useful. ► Copper Sulfate As An Algaecide? A friend of mine swears that copper sulfate is a great algaecide. He says that it is cheap and that it works. His pool does look good. What do you say? Your friend is partially correct. It is an effective algaecide and it is cheap. BUT IT SHOULD NEVER BE USED IN A SWIMMING POOL! Copper sulfate is used as an algaecide, in the treatment of surface waters, such as reservoirs, lakes and ponds. It should not be used in swimming pools and, so far as I know, no swimming pool chemical marketer or packager offers 100% copper sulfate for sale. At the pH of a typical swimming pool and in the presence of chlorine or other oxidizing agents, copper (from copper sulfate, natural sources or corrosion of heaters) can and will cause staining and discoloration of pool surfaces and hair. The copper products used, as swimming pool algaecides, are typically in a chelated (stabilized) form. These specially formulated products avoid the problems associated with copper sulfate. A Solar-Powered Dual-Ion Purifier/Mineralizer is an easier and less problematic way to use copper, as a means of algae control. I hope that you will heed my advise. Enjoy the season. ► Copper Level Not Going Away? We had an acid problem last summer and determined that it ate away at our heat exchanger this summer. We had copper issues all summer and used Metal Free. We replaced the exchanger and also unhooked the heater for the rest of summer. We can't seem to "remove" the copper that is in the water. It stays around 2 ppm. Our local pool store has had me try Filter Aide (many times) along with a 2 part clarifier with no success. Summer is over and we want to close the pool, but not with the copper present. Every time the chlorine goes up, so does the copper. We don't want to keep it at bay. We want to REMOVE it. Any suggestions would be appreciated. We are so very frustrated. Thank you! Adding metal "removers" chelates or complexes the copper and other heavy metals. It doesn't actually remove them, as that would incur precipitation, staining and discoloration. There is no mention in your letter, about staining or discoloration. If you add Pool Refresh, it will help you filter and vacuum out, the copper and other heavy metals. As a bonus, it will remove phosphates, as well. I hope that I have been helpful. ► Nasty Copper Stain Problem Solved? I recently had a nasty season-opening copper stain on my vinyl liner that was caused (I now know) by corrosion from my heater last season. The stain completely covered all of the sidewalls and bottom of my 27,000 gal in-ground pool. My local pool store recommended a stain remover product, which I used and nothing improved. Scrubbing of the walls and floor did nothing before or after the application of the stain remover product (which cost me $20 per quart and I used 3 quarts). Anyway, I noticed your site mentioned a Vitamin C tablet test, and I tried this test on one of my sidewalls and I was amazed. I pressed a normal sized Vitamin C tablet onto the side wall and I could write lines immediately – the stain came right off. 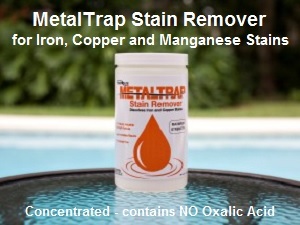 I ordered the Metal Trap Stain Reversal Kit, which contained everything needed to remove the stains and eliminate the copper and heavy metals from the pool water. Thanks, for having this information available on-line. No questions! Great letter! Glad to hear that it worked out. Just adding a metal treatment rarely works. The problem with Vitamin C tablets is that they contain other inert ingredients, that may cause interaction with swimming pool chemicals. The MetalTrap Stain Reversal Kit, available in our website store, contains the complete regimen of products to remove the stains, eliminate the metals from the water and help assure that a recurrence does not happen, after chlorine is added. I'll give you an "A" for effort! If you avoid the corrosively low pH, that caused the heater corrosion, the problem should remain solved. I am happy to hear, the website was helpful. HELP ME PLEASE! MY HUSBAND AND I PURCHASED A DOME FOR OUR ABOVE GROUND SWIMMING POOL! PROBLEM IS OUR HAIR IS TURNING GREEN ~ IT IS UNREAL! WE HAVE OWNED THIS POOL THREE YEARS BUT JUST PUT THIS DOME ON THIS POOL. WHY IS THIS HAPPENING? WHAT CAN WE DO TO ELIMINATE THIS PROBLEM? PLEASE EMAIL ME BACK. THANK YOU. The dome has nothing to do with the problem. There are two possibilities. One is that you have a heater and have subjected the copper coils to acidic conditions in the presence of chlorine and/or bromine. The other possibility is that you used a copper algaecide that may not have been based on a chelated or stabilized formula or used the product to excess. If you have a heater, it is the likely source of the copper. If you have a built in chlorinator, it should be plumbed in after the heater and should be separated from the heater by a check valve. Have the pool water tested for copper. The green hair is all the confirmation I need. To stop the problem, I suggest that you use a MetalTrap Stain Reversal Kit. It contains everything you need to remove any copper stains, eliminate the copper, from the pool water and help prevent a recurrence. So far as the hair is concerned, try this: shampoo in the usual manner and follow with a generous application of an acidic, Leading Brand Hair Conditioner. Leave on for 15 minutes. These products are very acidic and will helpfully pull out the green. Repeat again, as necessary. In the future, make sure that the pH is always in the 7.2-7.8 range and avoid the use of products that contain copper.. I hope that I have been helpful. ► Blue Something - Possible Copper Stain? I have a question. We had a small problem with mustard algae. We went to our pool supply and brought a water sample and they sent us home with some copper algaecide. Now our less than 1 year old pool has a blue something all over the bottom and stairs. We went back and they gave us a mineral remover. I don't know what to do now. Help! The "blue" something could be copper. If the copper algaecide was a chelated copper formulation, it would be unusual to cause staining, unless the pool water chemistry was far from optimum or, in the case of masonry pools, the pool finish had not completely cured. The product that you added is used to help control heavy metal staining. I doubt that it will remove the stains just by the simple addition of the product to the pool water. 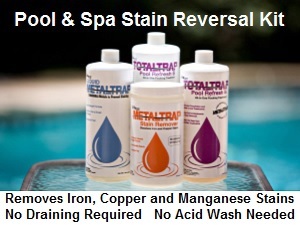 The MetalTrap Stain Reversal Kit contains a regimen of products, that will help remove the stains, eliminate the copper from the pool water and help prevent a recurrence, after chlorine is added. I would limit the use of copper algaecides and keep the copper at 0.3 PPM maximum. You might consider using a 60% polymer algaecide, as a means of mustard algae control. I hope that this information will prove helpful.